Composites are used for grouping other elements, and they have no visual representation. You can control how their children elements are arranged by specifying the layout attribute. See the Layouts section for information on how to control the look of the dialog. Groups are similar to composites, except that they are graphically delimited by a border and can have a title specified by the text attribute. Refer to Radio Button for an example. Labels are simple text fragments used to present information. 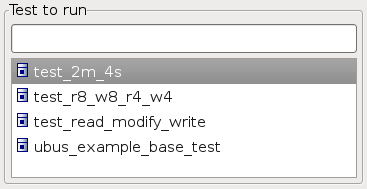 Refer to Textbox for an example. Lists all files/dirs that match a certain criteria in a specified folder. 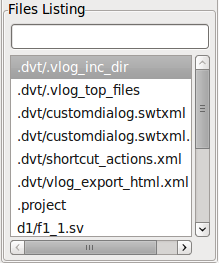 "**\*.e;**\*.vhd" matches all .e and .vhd files/dirs in a directory tree. "test\a? ?.sv" matches all files/dirs that start with an 'a', then two more characters and then ".sv", in a directory called test. "**\test\**\XYZ*" matches all files/dirs that start with "XYZ" and where there is a parent directory called test (e.g. "abc\test\def\ghi\XYZ123"). rootDirectory - can be specified as an absolute path or relative to a project in the current workspace. The path can also contain system variables. Note: The includePaths and excludePaths attributes use ant-like path patterns. 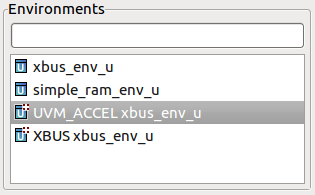 Note: This widget is only available for SystemVerilog. Note: This widget is only available for e Language. Note: The hierarchyLevels attribute can either be an integer, or all in order to control the displayed inheritance level starting from the when subtypes.